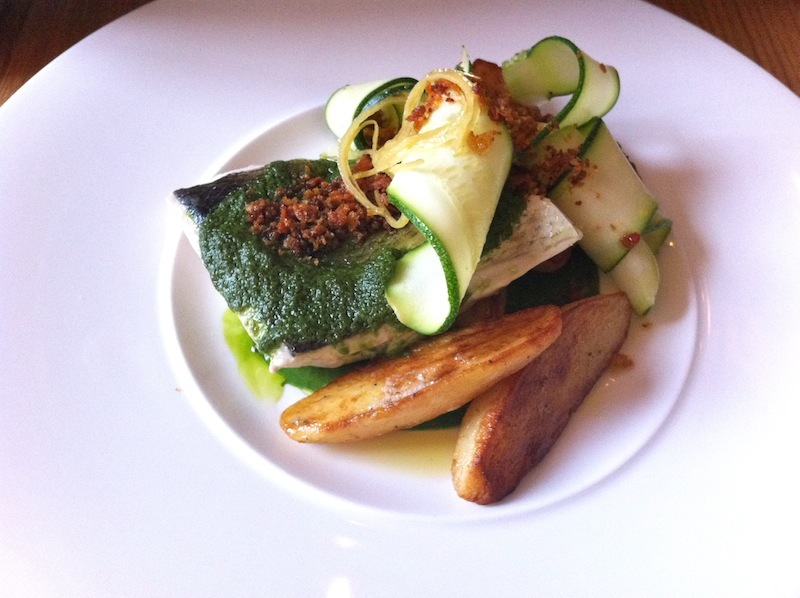 The Corner Room is Nuno Mendes's vision of neighbourhood restaurant that serves affordable and exciting food. 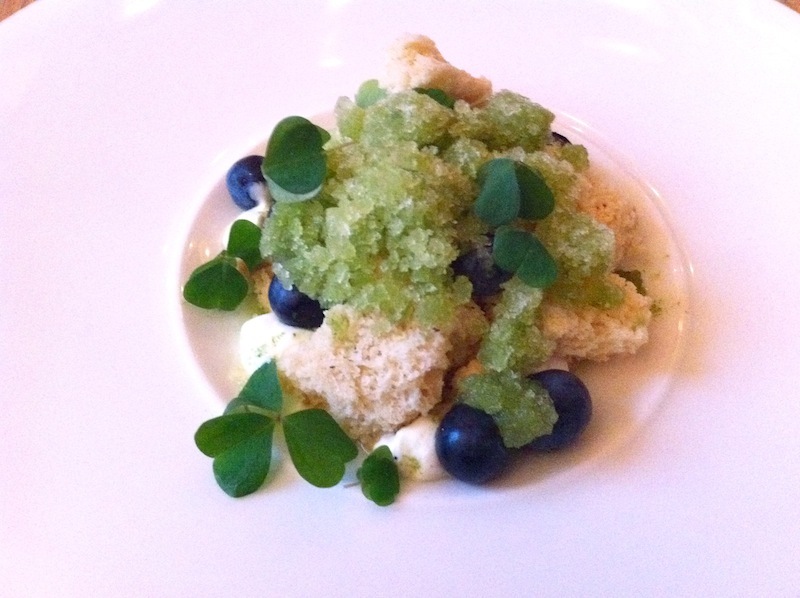 I became a fan of Nuno Mendes after my visit to his Michelin starred Viajante restaurant. 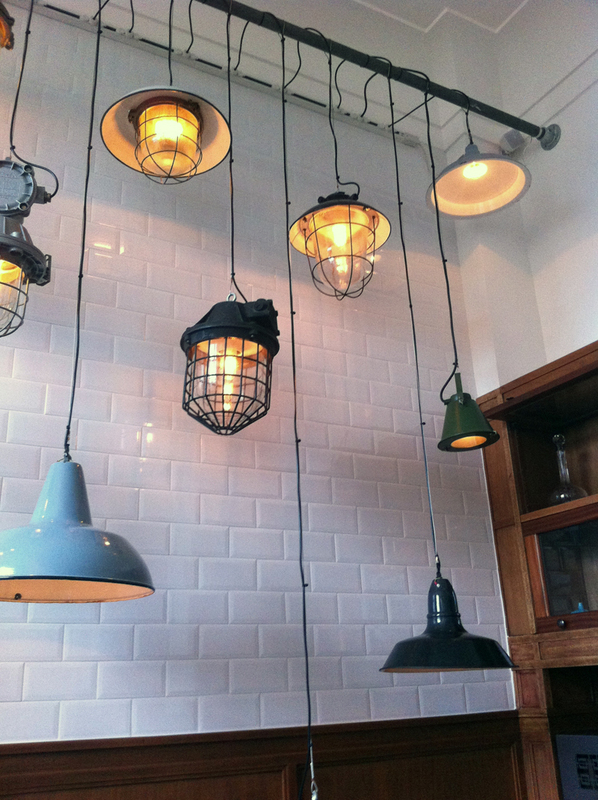 The restaurant decor of multiple hanging lamps in its wooden interior. 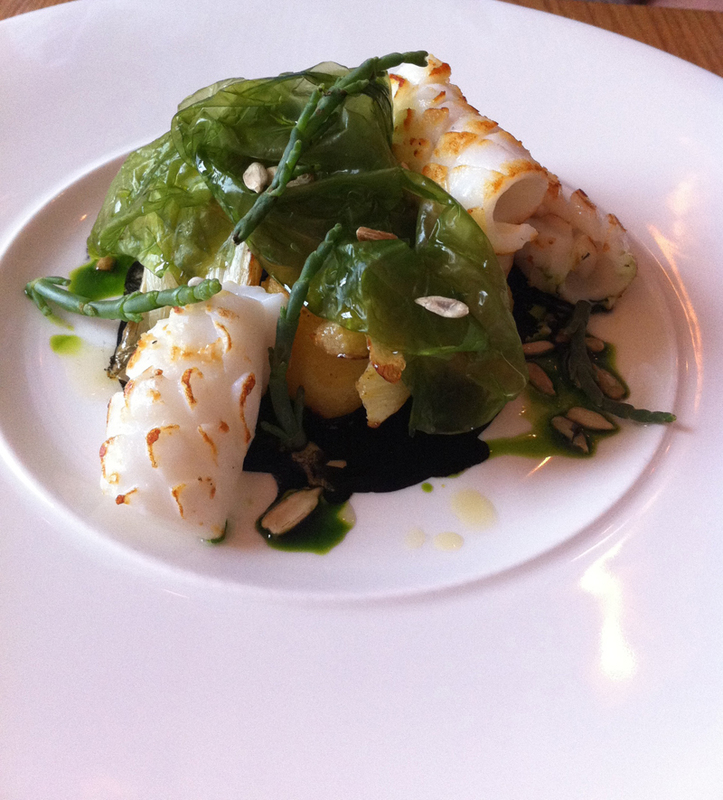 Squid, Jersey Royals and Fennel, beautifully served with black squid ink. This was my favourite dish of the night, other than the dessert. It is very pretty and playful. 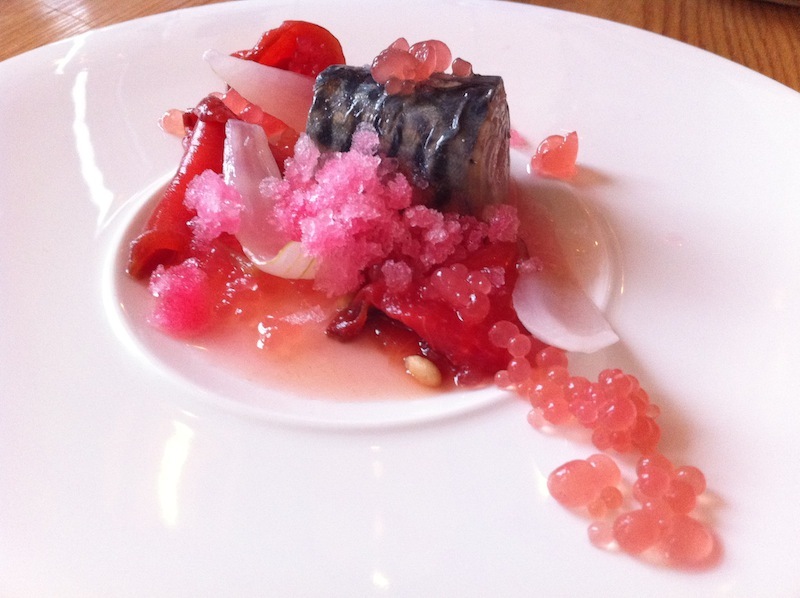 The granita gave a hit of coldness and then melts in your mouth combining perfectly with the mackarel. Those little pink balls are what they call the rhubarb caviar. This is done by releasing rhubarb flavoured liquid droplets with a syringe into a calcium bath. This is called spherification, a molecular gastronomy technique. What is interesting about these little spherical caviar is that every ball is only protected by a thin membrane and when bit into, the liquid oozes out. I bit those balls one by one to experience the oozing liquid although little, just cause I could. It is like pinching bubble wrap, but different. 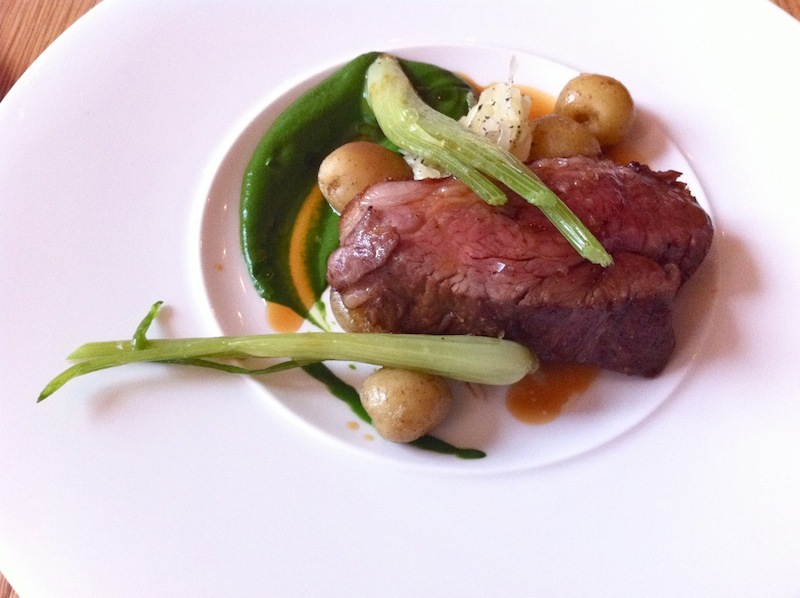 Lamb rump, Fennel and Salsa Verde, juicy and pink. I cannot remember the name of this dessert but it has a soil-like texture and moss-like taste to the dessert. Very intriguing taste and texture combination but not something I will order again. This dessert on the other hand, will be everyone's favourite. Chocolate and peanut butter on its own is enough to give you the picture of how indulgent this could be. 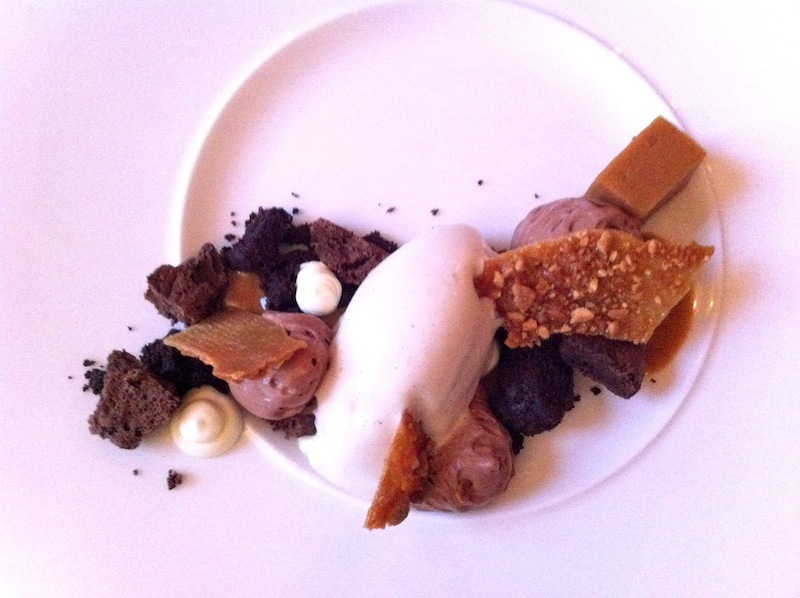 It was sweet heaven on a plate, with multiple texture; peanut brittle, crumbly dark chocolate brownie, smooth milky chocolate mousse, peanut butter cubes and silky peanut butter vanilla ice cream. This is by far one of my favourite restaurant based on affordability and quality of food. The service was equally fantastic, especially the Estonian girl waiting on our table. The corner room is in my opinion the experimental lab of Viajante with paying customers. Very artistic and fun. They never used to take reservation but now they do, only for lunch between 12pm - 3.30pm. Dinner is walk-in only, and is open for breakfast too. Inspiring, fun and affordable with great service.